Adenophora root is the dried root of a small perennial plant called Adenophora Triphylla, commonly known as Lady Bell. Adenophoras typically grow to about 3 feet tall and are native to east Asia. They grow throughout the mountains and lowlands of China, Japan, and Korea where there is bright sunlight and moist soil. In China, this plant is mostly cultivated in provinces like Anhui, Jiangsu, and Sichuan. Adenophora flowers, which contain both male and female organs, bloom in September, with seeds ripening in October. Adenophora roots are then harvested in the Spring and Fall. Once harvested, adenophora roots are striped of its outer layer of skin and sun dried for medicinal use as an herb. Adenophora roots are almost flavorless, with only a light sweet taste and a slight bitterness to them. 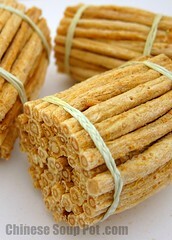 This herbal root is typically used in Asia in the form of soups to ease dry coughs, and to moisten the lung and throat. According to traditional Chinese medicine, this herb is known to have a cooling property and nourishes the yin to clear heat from the lung and help expel yellow sticky phlegm. It is also known to tonify the stomach and reinforce qi to promote the production of bodily fluids and moisten dryness. Adenophora root is also used to relieve symptoms of stomach yin deficiency such as dry parched lips or thirst. 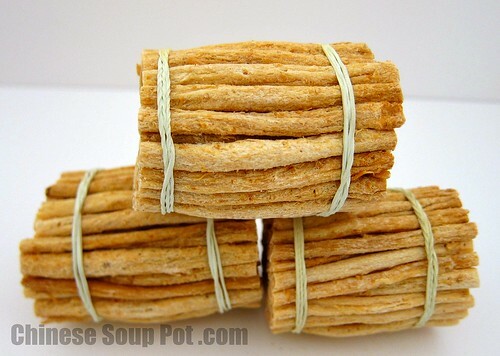 See a list of recipes using adenophora (lady bell) roots. Soak the adenophora roots in cool water for 2 – 5 minutes, then rinse in cool water. Adenophora roots are often sold in packages and wrapped in small bundles as seen in the photos above. They can be found in Chinese herbal stores. Good adenophora roots should be clean, firm, but pliable. Those with a cold cough or have a spleen deficiency should not use adenophora roots as symptoms may exasperate. Adenophora roots is known to be incompatible with the toxic veratrum herb, and this combination should not be taken together. How do you use your Adenophora Roots? Leave a comment below to share your ideas. Disclaimer: Content on this site is for informational purposes only, not medical advice. Do not use site content in place of a medical doctor. I love how healthy this ingredient sounds! Such a beautiful, elegant name too! I’ve never heard of this or I don’t think I’ve seen it either. Looks very interesting. Chinese uses so many harbs. It’s nice that people are aware of healthy options and use it for daily cooking. I don’t think I’ve had this, but as always I’d love to experiment! I love this informative ingredient series of yours. This sounds like something we could use this time of year when colds and flu are prevalent! Looks like a must-have during the winter months!